I only truly began to fall for this novel towards the end. Gretchen, the protagonist of this debut whose relationship with Adolf Hitler is intimate enough that she addresses him as Uncle Dolf, reads far younger than her age for much of this novel. Prisoner of Night and Fog chronicles her much needed wake-up call as she finally recognizes the lies that she has been fed all her life. It isn't until almost after half-way through the tale that she begins to come into her own; formulating her own opinions and leaving behind the teachings of Uncle Dolf. I thoroughly enjoyed watching Gretchen grow and change remarkably over the scope of this novel. From her former naivety to the bravery she accumulates like a cloak, her character is tremendously inspirational and downright believable as well. Despite aching to free her family from Uncle Dolf's influence as well, Gretchen is nevertheless prone to cracks of vulnerability in her armor. What's more, despite the fact that her profound change is precipitated by Daniel, a Jewish reporter who reveals that Gretchen's father did not die saving Hitler, as she believed, Gretchen's actions are self-motivated. Instead of dismissing Daniel, Gretchen discovers that her father was murdered by a member of Hitler's own party and her steps to discover just who murdered him are not solely a result of Daniel's influence. Gretchen and Daniel's romance is sweet and nurturing; a support system in a time when they both lack precisely that. Gretchen's family is falling apart, whether it be her older brother who harbors psychological illnesses of his own or her mother, determined to do right by her elder child even if it means sacrificing much of Gretchen's own happiness. Each of these relationships is so nuanced and rich, full of scope and depth, and yet they also align perfectly with history. Many of the characters in this novel are real Nazis and the manner in which Blankman weaves Gretchen's fictional tale alongside Hitler's slow accumulation of power is tremendous. In learning of WWII, we often learn of the Holocaust and the end of the war, not Nazi politics, so the fact that this novel remains intensely political is a welcome surprise. I didn't expect to enjoy this novel as much as I did. Perhaps if I had, I'd have picked up my ARC sooner. But Gretchen is a heroine I can get behind, just as Daniel is a love interest I can swoon over. It isn't an easy path for these teens but their struggles are realistic, rooted in history, and not without their sacrifices. Although Gretchen's narration reads young, many of the brutal events in this novel are definitely geared towards a more mature set of readers. Blankman provides a detailed explanation of fact and fiction at the closing of this debut which made for fascinating reading, particularly as many of the facts revealed were ones I didn't know myself. She goes into great depths about the psychological mindset of not only Hitler, but many high-ranking Nazi officers, and Gretchen's search for her father's killer brings her face-to-face with a myriad of other realities she is forced to accept. 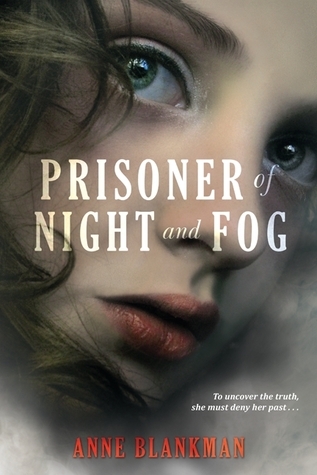 Brilliantly written, Prisoner of Night and Fog is one historical fiction debut you won't want to miss. So many people have loved this, I'm so afraid I will be one of those that doesn't or that only feels so so about it. Lovely review! It definitely sounds like this isn't perfect but has a lot of redeeming qualities to it as well. I started reading this soon after I got last year, but the Gretchen's voice wasn't all that appealing to me. I guess you hit the nail on the head when you say she seemed a bit younger than her real age. I still think I'm going to give it another go, but perhaps I still need a bit more conviction. Lol. I remember picking up my ARC for this book and I couldn't get into it, but I pretty much love all stories involving WW2. I think I'll have to pick it back up! That's so cool that Blankman revealed facts to you that you didn't know about. And Gretchen and Daniel see like fantastic characters! Looks like the romance was well done, too. Thanks for your thoughts, dear! I completely agree with everything you've said here Keertana. Like you said, Hitler was so well-developed in this. It was morbidly fascinating seeing all these different sides to him; as we're all used to hearing about what a horrible man he is and how he started this horrible genocide; but Blankman really takes it farther and shows us the charming, politician side of him; the loving uncle; and the psychopathic side of him. I'm so happy and relieved that you ended up enjoying this book! I felt that Gretchen's voice was young with good reason. She grew up sheltered in a weird way, and encuraged to stay young and childish and never to think for herself. So I thought that her voice reflected her upbringing and was delighted to see her break away from it. I hope you'll get a chance to read the second part soon. It's funny because I just moved this one up my mental TBR recently so seeing you enjoy this novel has definitely added to my excitement about reading the novel. I bought this soon after it was released, but I still need to read it. I'm glad you liked it more than you thought you would. I like books set in this time period, and it's cool that it starts when Hitler is still seen as a relatively "good guy." I'm glad you liked this for the most part! It's one of my favorite duologies - I hope you'll be able to pick up the second book soon enough. :) I found Gretchen's journey so realistic and moving; I was worried I wouldn't be able to relate to her in the beginning, but from the first page I liked her voice and who she was. Daniel is an amazing love interest, and we get to learn even more about him and his family in Conspiracy.